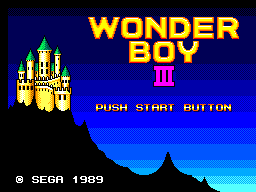 Wonder Boy III: The Dragon's Trap, called Monster World II: Dragon no Wana (モンスターワールドII ドラゴンの罠) in Japan, is a direct sequel to Wonder Boy in Monster Land, and was developed by Westone and published by Sega for the Sega Master System in 1989. The game should not be confused with Wonder Boy III: Monster Lair, which despite being made by the same people and carrying a similar title, focuses more on being a side-scrolling shoot-'em-up with platform segments. The Dragon's Trap is a direct sequel to Wonder Boy in Monster Land, to the point where the introductory stage is a remixed version of the final round of Monster Land, complete with music and a fight with the main villain of the last game, the (robot) Dragon, Meka. The game begins with Wonder Boy being able to slay enemies and take damage with relative ease, but after beating Meka, he will be "cursed" and be forced to escape the castle as "Lizard-Man". Once this is done, Wonder Boy III proper will begin. Gameplay is similar to Monster Land, however the "arcade" elements of the previous game, such as time limits and a linear progression through levels are dropped for a more open-ended world, with Wonder Boy visiting areas more than once. The objective is obtain all the parts of the "Salamander Cross" by beating "boss dragons", allowing Wonder Boy to return to his human form. As more pieces are collected, Wonder Boy will receive powers allowing him to travel to previously inaccessible parts of the map. Like Monster Land, equipment and health can be upgraded along the way. Enemies drop coins, which can be used to purchase items from shops. The game is much larger than its predecessor, and now includes a password system to allow players to pick up where they left off. Your first form. Besides long range attack and ability to crouch, it is the weakest form. Diminutive size allows him to squeeze through small areas and climb on checkered blocks. Swipes the sword in a 180 degrees arc towards the front and can break blocks around him. Strongest attack power. Can fly around and reach places otherwise impossible to reach. Takes damage if touches water. An arguably better version (minus the Wonder Boy branding) exists in the form of Dragon's Curse, released for the TurboGrafX-16 in the years that followed. Confusingly this version of the game is known as Adventure Island in Japan, though bears little resemblance to the Adventure Island franchise, itself branding off from the original Wonder Boy game. The Dragon's Trap was also brought to the Sega Game Gear in 1992. International releases of this port dropped the "III," calling it merely Wonder Boy: The Dragon's Trap (a prototype ROM with the original name circulates around the Internet). Both the TurboGrafX-16's Dragon's Curse and Wonder Boy III: The Dragon's Trap have been released on the Wii's Virtual Console service, despite being roughly the same game. A similar situation occurred with the sequel, Wonder Boy in Monster World. The game was eventuallly remade by Lizardcube and published by DotEmu in collaboration with the original game designer Ryuichi Nishizawa. The game was released on April 18, 2017 on PlayStation 4. Xbox One, and Nintendo Switch and PC in June of that same year. Main article: Wonder Boy III: The Dragon's Trap/Magazine articles. NEC Retro has more information related to Dragon's Curse.